The new heavy duty mechanical (non electronic) combination slide bolt is a high quality product, based around the innovation of the worlds oldest known lock. Great for many types of installations. No key required. 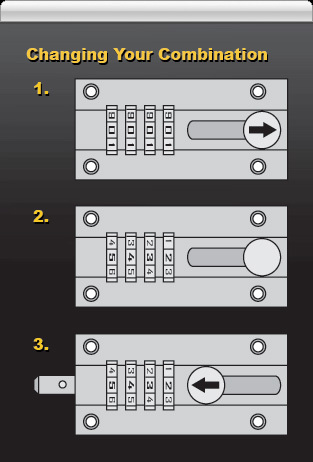 Simply set the four digit combination & bolt away for all your medium level security needs. 10,000 different combinations possible. The Combi-Bolt dials are factory set to 0000, this is recodeable to your own secret number in less than a minute. Once set to your desired numbers the lock is easy to use. Just draw the bolt & turn the dial. The chances of somebody breaking the code of your secret number and gaining access to your locked area is 10,000 to 1. Incorporates a unique anti pick mechanism. Easy combination change in seconds. Much more secure than an ordinary bolt. Ideal for outdoor use, totally rust proof. Reduce the risk from opportunist theft. Setting the Combi-Bolt takes only few seconds. Just follow the instructions below! We recommend reading all the steps once before starting. Step 1. Determine your new code before starting to change the combination. Writing down the code and storing it someplace safe is always a good idea with combinated devices. Step 2. Hold the Combi-Bolt in your hand with the handle on the right side and the bolt on the left. Step 2. Set the dials to the current combination. Note: All Combi-Bolts are manufactured with their combination set to 0-0-0-0. Step 3. To initiate the change, first lift the handle up and then slide it back completely. The finger grip will slide down into a notch when it is all the way back. The Combi-Bolt is now in change mode. Step 4. Turn the dials to your new combination. Step 5. Lift the handle up and then slide the bolt forward completely. Note: The Combi-Bolt is now out of change mode. The combination on the dials is now the current code. 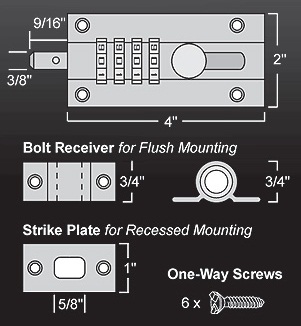 Heavy Duty Dust Proof Strike Plate Used primarily with drop bolts or slide bolts when the lock is at the bottom of the door. It will keep most of the dirt out of the bolt hole. Comes with to screws and 2 anchors.